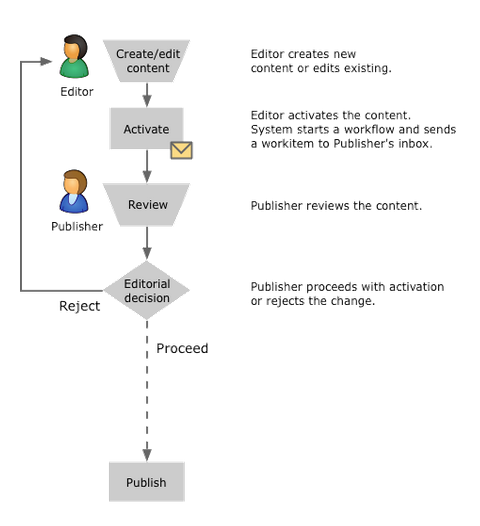 Workflow rules for content contributors that flow content up, through an approval process, from creator to editor, to "brand manager" to "marketing" and then to be published. Alerts to content contributor and editor (and higher) on content age and requirements for refresh. The most critical content many have alerts to several people. The ability to embargo content, meaning content that can be created, edited and approved today and scheduled for publication in the future without further activity (all driven by workflow rules). The ability to expire content, meaning that content can automatically be removed at a specific date in the future when it will no longer be current, again, driven by workflow rules.